Location: Legé, in the Loire-Atlantique departement of France (Pays de la Loire Region). Notes: Château de Retail is a castle located in Lege, France, in a place called "The Retail".Composed of a complex of buildings forming a "U", common found right there (bakery with bread oven and stable, left the room for the service center and the stately home of which there are only the facade. Each arm ends in a house dating from the second half of the seventeenth century, as the central front. beyond the facade, is a likely turn of the fourteenth century with its roof pepperpot dating him , early twentieth century. Later, in the middle of the farm building is the chapel, dating from the early fifteenth century. 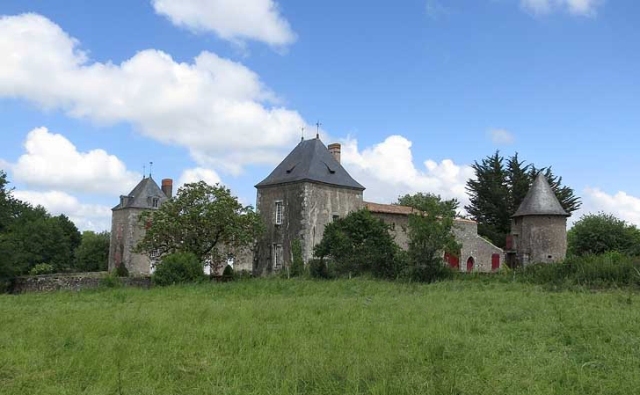 Its founding act by the three Prevost brothers who shared the lordship, date of 1499. not far from the chapel, stands a porch with uncommon on its top, five stone balls.The Retail castle grew around an ancient fortress advanced Poitou facing Britain. It shows a turn of the fourteenth or fifteenth century and an imposing buildings built in the fifteenth, sixteenth and seventeenth centuries arranged on three sides of a courtyard where one enters through a porch. Two other porches give access to the farm. The main facade of the building dates from the seventeenth century. The castle has a remarkable Gothic type chapel built in the fifteenth and sixteenth centuries, which you can admire the entrance and the altar of granite. During the Revolution, the chapel of Retail served as a parish church to the abbot Barbedette Luc of the priest. In 1863, the March of Retail was attached to Legé. The castle was owned by the family of Saint-Hilaire, lords of Grand'Landes and Retail in 1583, the Goulard family through the marriage of Marie de Saint-Hilaire René Goulard in 1646 and Gaignard families, Germond Baudry d'Asson and Baudry. The monument is registered as historical monuments in 1974.